In this post we are going to take a look at how the Equality Act applies in terms of security measures. The duty to make reasonable adjustments has the objective of, as far as is practicable, ensuring that disabled workers or visitors to buildings have the same access to everything a non-disabled person does. Employers and building owners have a duty to take steps to reduce or remove any obstacles a disabled person may come across. If an employer or building owner doesn’t take such steps and a disabled worker or visitor can demonstrate that there were barriers that should have been identified and reasonable adjustments made, then they may be liable for a claim being made against them. So what aspects of equality should be considered when designing or upgrading a security system? 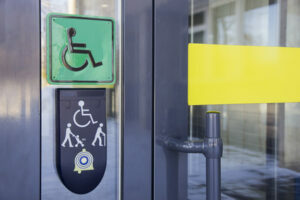 You’ll need to think about whether automated doors are suitable for wheelchair users. What about door entry systems? Are they located at a height that is accessible to someone in a wheelchair? Can they be used by someone who is blind or partially sighted? Think about installing dual height systems perhaps with braille controlled access. Are your fire alarms suitable for the hard of hearing? What methods do you have in place for alerting people who cannot hear audible alarms to the fact they need to evacuate the premises? Consider a visual alarm system, such as one that uses lights, to counter this issue. Public address systems are designed to make critical announcements in the event of evacuation or lockdown scenarios. But how will anyone who is hard of hearing fair with such announcements? The addition of a visual noticeboard is vital if you are going to make your security systems accessible for all. All one-storey, non-residential buildings are required under Building Regulations to provide a ‘safe refuge area’. This area must have a two-way communication system installed. The objective of the refuge area is to provide a place for people who cannot use fire escapes to gather in evacuation or emergency situations and use the two-way system to summon assistance. These communication systems can be coupled together with the fire alarm so they only become functional when the alarm is activated. This prevents mis-use. Emergency assistance alarms installed in toilet facilities allow anyone in distress to raise the alarm when an issue arises. These are usually ceiling cords that when pulled activate a light and audible sounder outside of the WC. These alarms are also ideal for use in areas like receptions, changing rooms, solariums and meeting rooms. If you are looking to install Equality Act compliant security measures on your premises, the specialists at Barry Bros Security are well-placed to provide you with the tailored advice you need. We can custom design solutions that are bespoke to your premises and meet the specific needs of your employees and visitors. For a free initial consultation, get in touch today.